Going by the wet weather over the last few days, I was not overly optimistic about being outdoors with J any time at all this week. Driving to pre-school and all the other song-and-dance groups and playgroups does not constitute outdoor fun. 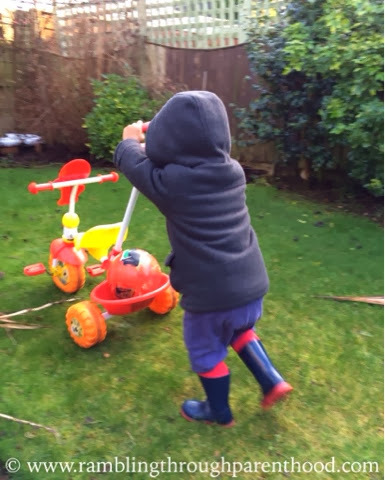 Going outdoors is defined as pulling on your wellington boots and walking running about on two little legs. As anybody with a young child will know, Saturday mornings mean nothing to these toddlers. So we were up at the crack of dawn today, which, being winter, was about half past six. I was pleasantly surprised to find a ray of winter sunshine streaming in through our window by the time breakfast was done. We just had to make the most of it. So coats, wellies, gloves and scarf (for me) in place, we stepped out into our back garden and into the cold winter sunshine. It was a welcome release for all of us after being cooped up indoors for the best part of a week. So what did we get up to in our back garden in the not-so-warm winter sun? We ran from one end of the garden to the other. We ran round and round in circles. We tried to chase and catch each other. We played hide and seek. Or "Where's he gone?" in Jspeak. We jumped in a sloshy muddy patch of grass. We pushed the broken tricycle up and down the garden. Then we put a large plastic ball in the little carrier at the back of the trike, and took it for a walk all around the garden. 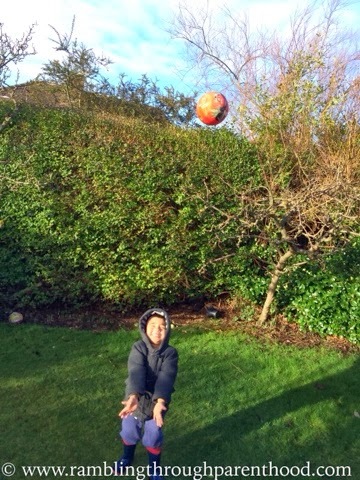 We kicked the ball with all the strength our legs could muster. We threw the ball high up in the sky as far as it would go. And then we waited for it to come down and plonk on our heads. Up and away it goes! We squinted up to see an aeroplane flying high up in the blue sky. We put out bird feed in the seed holder. Then we waited and waited for the birds to come, for we could hear them in the bushes. We pulled up fistfuls of muddy grass and threw it over our heads. We looked for kitty cats, foxes and doggies hiding in the hedge. Then we looked for Thomas the Tank Engine and all his friends to see if they actually were in our garden. And then the skies darkened and the hazy winter sunshine was gone. The heavens opened up, and we scampered back in, muddy wellies and all. The advantage of playing in the back garden is being able to dart back in when the weather turns nasty. What fun J had playing while the sun was shining, thanks for linking up and sharing your fun with Country Kids. I think it is a little therapeutic for grown-ups as well! What a lot of fun things you did! It's nice to see sunshine for once. It was a very long wait for the sunshine, but worth it in the end. Oh that looks like fun - makes me want to go out in our garden, though I'm afraid of the mud. I was afraid too. But then I pulled on my wellies and decided to bite the bullet. It just makes everything feel so much better. Sounds like you had a fun filled weekend. lots of fun! i was so excited to see the winter sun on saturday! shame it was still very cold though! I agree. And the wind had picked up by mid-day. We did manage an hour and a bit out though. Well done you! I really must get out this coming weekend! Oh that makes me long for a bigger garden! Ours takes two seconds to run from one side to the other! Tbh, mine prefers going to the big park. That is a great use for that wintery sun :) Sounds like lots and lots of fun! It was so nice to have some sunshine on Saturday after that rain filled week. Thanks Orli. It really was a welcome break. 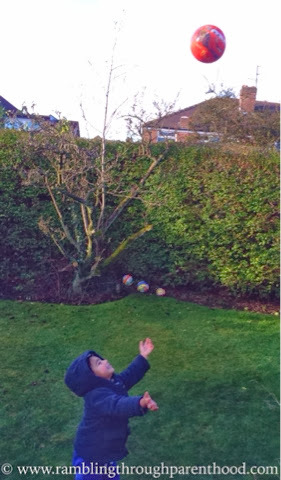 My children are constantly asking to play outside in the garden, it's amazing the things they can find to occupy themselves for half an hour. Kids have such wonderful imaginations. They really don't need much to keep them amused and occupied. You certainly packed lots into your time in the garden! 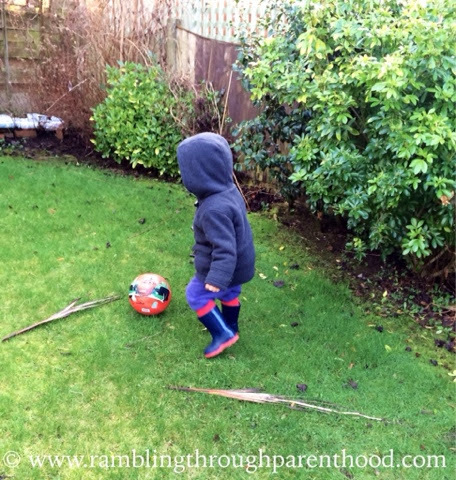 It's strange that I often overlook playing in the garden as an option to get us up and outside! Horrrray for a little bit of putdoor fun time! Looks like a good time in the garden.